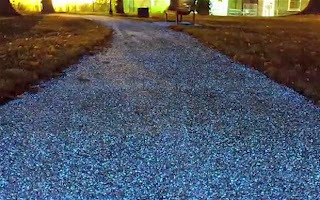 Cambridge City Council has covered an historic city pathway with ultraviolet particles which turn blue when the sun sets, in what could be the future of street lighting.The technology, called 'Starpath', absorbs light during the day before emitting the artificial glow in the evening.It is thought technology could one day replace streetlamps as a cheaper and more energy efficient form of lighting.The technology is currently being trialed at Christ's Pieces in Cambridge and now the council have revealed they could adopt the path elsewhere in the city.Cllr Andrea Reiner, the executive councillor for public places, said: "This is an interesting idea that the surfacing company asked if the council would like to explore for a trial period. 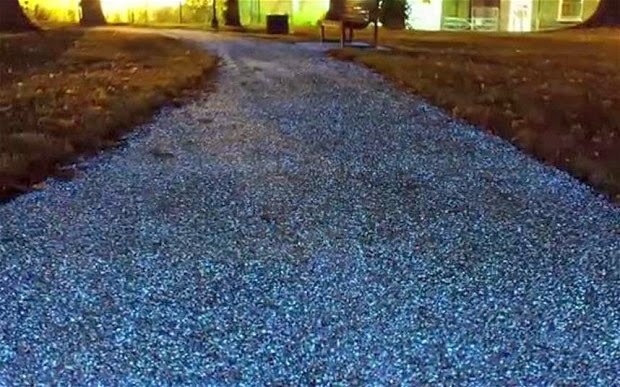 The glowing particles can be painted over existing paths to turn a dark road into a stretch of bright color, no overhead lighting required. This could allow cash-strapped towns to keep their streets safely lit at night while eliminating the cost of street lights. The Cambridge City Council has said that if Starpath works out well in the park, it might be expanded to cover other part of the city. The technology might be useful to illuminate the bike lane of a road, for instance.